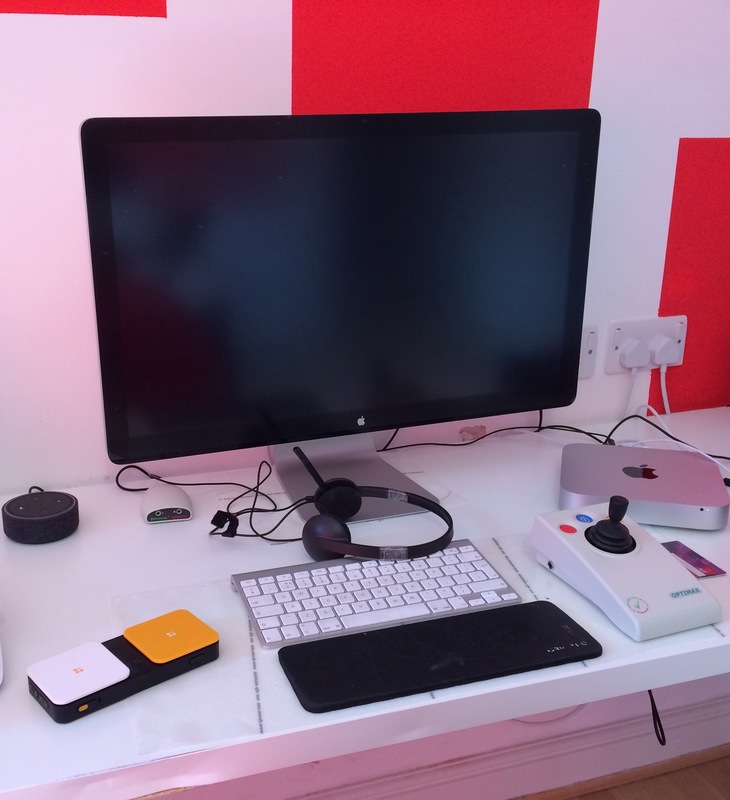 I'm so pleased to finally found a computer setup I can use - text dictated through my microphone, the mouse curser controlled with my joystick with right hand and separate buttons to press with my left. My microphone is a Logitech one - it was about £15 but I had to be careful to buy ones which were Mac-compatible. I asked my PA to tape them at the side as I was fed up with readjusting them every time I put them on my head. I use this to dictate to my computer - see the Dragon NaturallySpeaking page. I've known about joystick mouse controllers for years but couldn't get into my head how you'd control a mouse with one. I finally tried one at Naidex this year and knew immediately that one would be the answer to all my problems. Using the mouse made using a computer so frustrating for me - I really do love it. I got mine and the separate buttons from https://www.inclusive.co.uk (look under "switches"). I wasn't really sure what I needed so I phoned them for their advice. They said to actually place the order online as then I could get VAT exemption.